Jerusalem Cricket (also known as a Potato Bug) recently found in our flowerbed. When our Sonos sound system is amped up playing the same song over and over by every artist imaginable (thanks Spotify!) I know that another blog topic is cooking in Ann’s head. It’s become a game of sorts between us; I will ask what the music relates to and she will say “what do you think?” So, when the lyrics “Jerusalem! Jerusalem!” started booming throughout the house recently, the game was on. “Potatoes?” was what came to mind first. After all, the “Jerusalem cricket” is what I called a “potato bug” when I was growing up. Of course, I had to play my own competing “music” (actually drumming) of a potato bug. Just for the record, Jerusalem crickets are not really crickets nor do they have anything to do with potatoes and they are not bugs. As a kid I was both fascinated and repulsed by these fierce looking creatures that lived under rocks in my back yard. I still get a strange thrill when I come across one of these bad boys. My retirement status has provided me with an opportunity to return to my childhood obsession with critters that live under rocks. It gave me time for docent training at Bouverie in Glen Ellen, a 500 acre preserve devoted to educating young children about the natural world. Most important for me is that I now get to poke around under rocks with 3rd and 4th grade kids looking for potato bugs, among other things, and not be considered a weirdo. Although being a docent is a kick, I have to admit that after nearly 40 years of teaching university students, the transition to dealing with these munchkins has been eye-opening, if not humbling. Let me say at the outset that my admiration for grammar school teachers has increased tenfold (nay, a hundredfold) since I started doing classroom presentations at grammar schools prior to the students’ visits to the preserve. Trying to convince 25 to 30 3rd or 4th graders that Bouverie is a cool place is a very different animal than lecturing about symbolic interactionism to a classroom of university students. Just dealing with their unbounded energy, curiosity, and figidigity (my own word) is a challenge in itself. 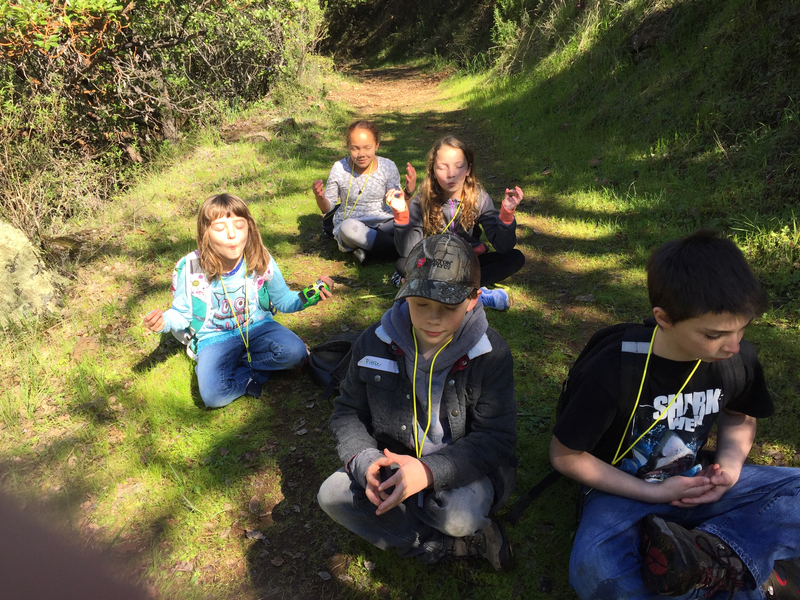 Trying to tell them about the rattle snakes, newts, and turret spiders that they may encounter on the hike is an even greater challenge. A question like “Have you ever seen a blue-bellied fence lizard?” inevitably brings a sea of waving hands, each attached to a kid with a breathless story about the lizards in the back yard or when an uncle caught one or when the cat brought one into the house. I was stopped in the middle of one of my presentations when a girl put her head on her desk and started to sob while another girl patted her back saying “it will be ok.” She told the teacher that one of the little boys had bitten her during recess. Finding no incriminating tooth marks on the girl the teacher let it pass. This sort of thing was not covered in my docent training manual. Rain time on the trail. The real reward for all of this comes at the preserve on hiking days. 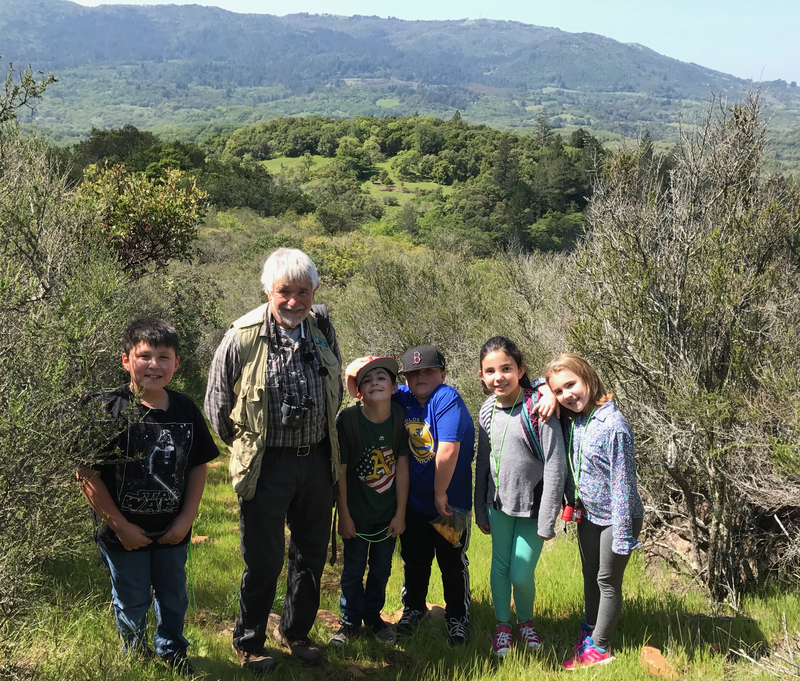 Each docent takes up to 5 kids and an adult chaperone on the preserve trails, letting them stop and examine everything from the marvelous harvester ants to the amazing oak galls found on fallen leaves. 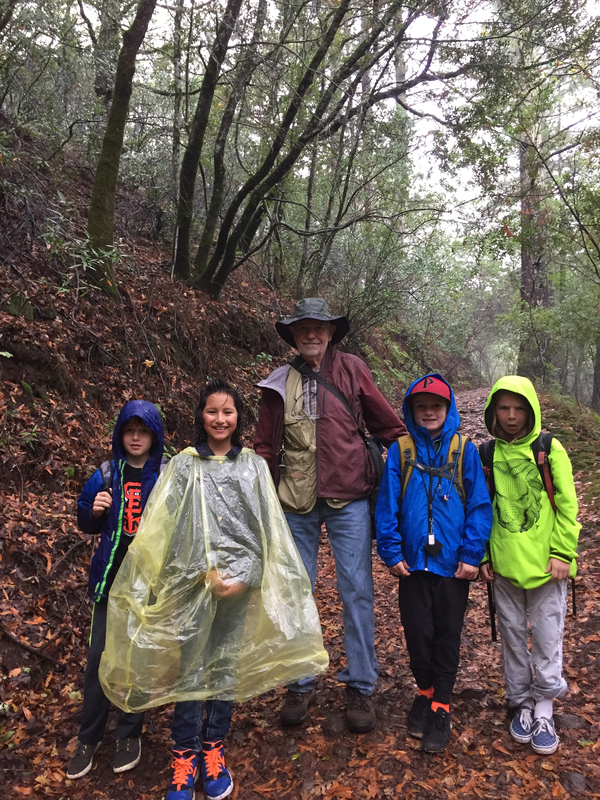 Their excitement when coming across red-bellied newts or banana slugs on a drizzly day is contagious. And you never know what they will come up with. I was taking a group up a relatively steep path leading to “Cougar Pond” when one of them asked if they could take a breather. Sure, I said, and they all immediately plopped down in the middle of the path, crossed their legs, closed their eyes and began to do the “uhmmmmmm”s of meditation. That was not covered in the training manual either. One of my greatest pleasures, though, is when the children are crouched around me watching as I cautiously turn over a rock and I hear their gasps when they come face to face with a Jerusalem cricket. It’s just like being a kid again, only better. We called these creatures “Child of the Earth” and were dead certain they were poisonous. (They aren’t. I don’t think they can even bite people, though I’ve never had the temerity to handle one.) And though I don’t know whether people bite them, I do know that actual crickets can be and indeed are eaten in Mexico, fried, salted and sprinkled with chile and lime. Not surprisingly, they taste like salt, chile and lime, which is a delightful combination of flavors. I suppose the only role of the cricket in this dish is to horrify persnickety onlookers, which is of course to my mind reason enough to include them. My brother Dan claims our parents referred to them as “babes of the earth,” which i don’t recall. Wikipedia claims the Spanish terms are niño de la tierra (“earth child”) and cara de niño (“child’s face”). With regards to eating them, someone asked if they tasted like chicken. I am not about to find out, but Dan says that his chickens love them. Andy, this is such good writing and so fun to follow! You are too kind… But what else would I expect from a fellow docent and wonderful neighbor?